While his guys work in the "field" of the wall applying epoxy and filling nail holes, Woody has started addressing the windows. The windows on that side of the house had substantial dry rot from some bad caulking work (done by modern painters) and a few generally dumb design decisions (made by Mr. Holt). 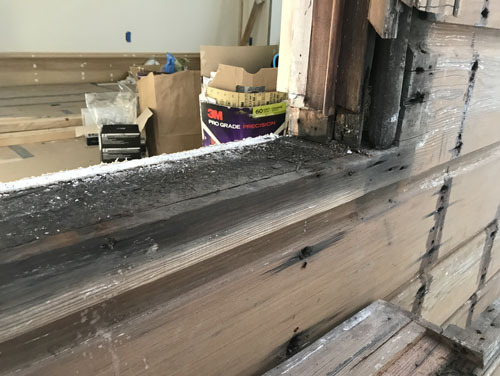 One issue was that the windows were leaking during construction, so the general contractor's carpenters "fixed" them by adding a slope to the sills. 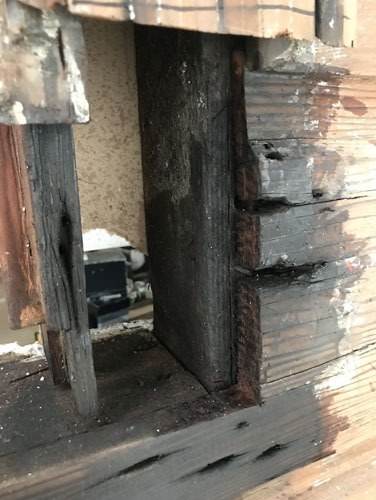 That didn't actually fix the issue, unfortunately, but Woody thought he might be able to just add wood on top to fix them. This turned out not to be the case. Here's the sill of the window in the front bedroom (Bedroom 1), in the process of being removed. You can see the extensive wood rot that we are dealing with here. 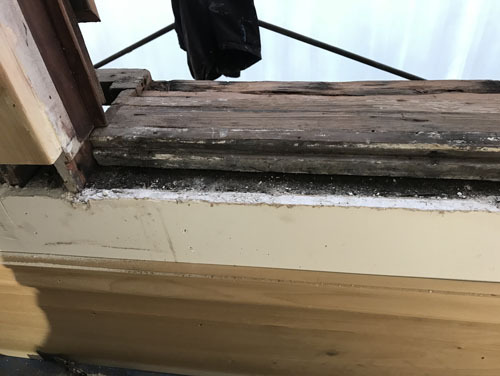 Fortunately the rot appears to be confined to the sill itself, and the rest of the framing is pretty good. Woody will go get some wood tomorrow to make new sills. 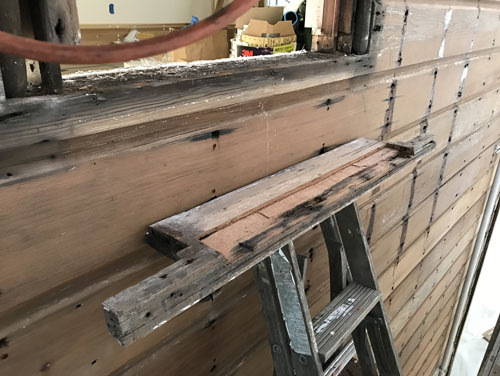 The main reason why cutting away part of the wood didn't stop the leaks is that that's not where the leak was coming from. And in the back bedroom, here, you can see more wood rot, though to be fair this looks worse because it is right next to a white wall. 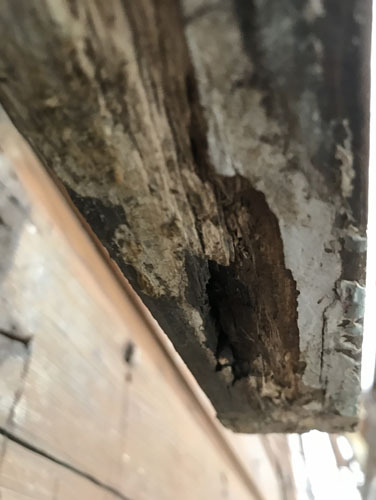 The is the underside of the outside of the sill, which is not in good shape at all. 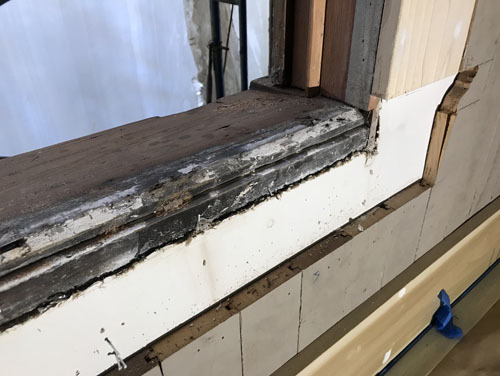 And here's the actual culprit for the leak: water was getting into the pockets of the windows, and the trim was caulked at the bottom so it could not flow back out. So it would fill up the pocket and overflow into the house. Woody is now treating these with epoxy and will fill in the holes the water was getting in through, while leaving the drainage path in place. Since the painters have moved on to a new side of the house, does that mean the roofers can come back to fix whatever problem there was with the new roof? Or did that already happen? They've been able to do the repair for a month or so, but we've not scheduled it yet because the general contractor wants to have all his stuff happening at once to maximize the use of his time. Fortunately, the repair is really just replacing some panels that they dented, so it's cosmetic only. This post stressed me out! Epoxy can really fix all that?! No, rotten wood is rotten wood. Some needs to be removed and replaced. Then the epoxy comes into play.